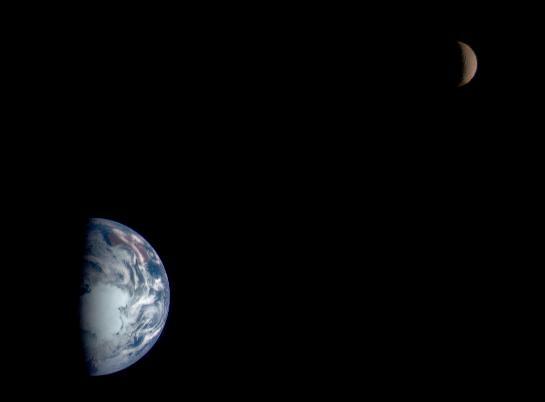 What role will new commercial firms have in exploring Earth-Moon space? I will take advantage of the growing partnership between NASA and innovative commercial space firms. We will follow through on plans to contract for cargo delivery to the International Space Station, using innovative, low-cost launch systems from SpaceX, Orbital Sciences, and others to address the ISS logistics deficit looming after 2010. If commercial resupply proves reliable, we may explore commercial crew transport to ISS, easing reliance on the Russian Soyuz for transport and lifeboat functions. If we can move routine LEO transport to the commercial sector, NASA’s savings can be focused on cutting-edge technologies for the exploration frontier. As we explore the Moon and near-Earth asteroids, commercial spacecraft may help us map terrain, and deliver supplies, small rovers and excavators. These robot prospectors, commercially operated, will help establish a long-term human presence in deep space. Success in LEO and on the Moon will lead to commercial operations to recover water, oxygen, and even metals—the first industrial operations in space. Is NASA’s aeronautics program supporting the nation’s future needs? At just over half a billion dollars, aeronautics comprised just 3% of NASA’s 2008 budget. Global competition for the next-generation of aircraft sales means we can’t afford to neglect the fundamental research in support of the U.S. aviation industry. We must also forge ahead on new infrastructure to expand America’s air commerce. We need greater investment in advanced aircraft control and flight deck technologies, design of a modern airspace system, and fundamental research into the materials and propulsion enabling hypersonic flight. I will have to convince the administration and Congress of the value of research in maintaining our economic strength, and in producing breakthrough technologies for industry and the military. 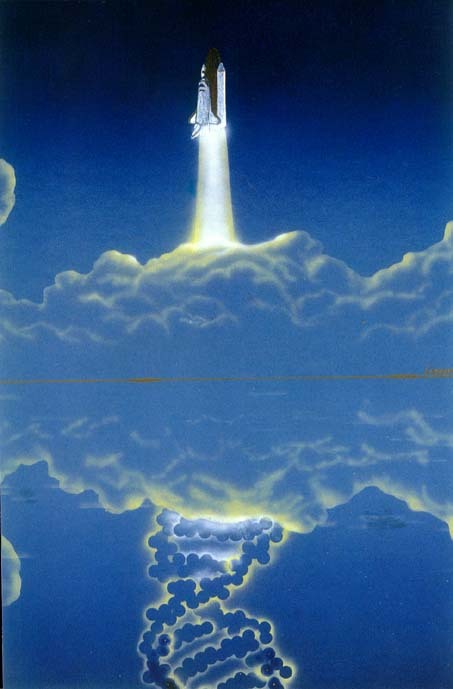 Jon Lomberg's "DNA Leaves the Planet"
Commissioned by the Life Sciences Division of NASA in 1986 to illustrate a publication about their work. 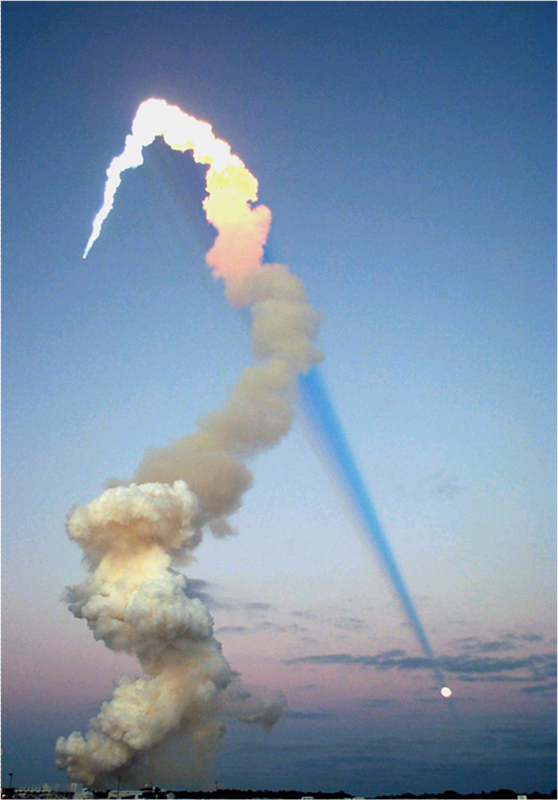 The artist imagines the lift-off of a Space Shuttle as symbolically and literally carrying Earth’s DNA into space. To see Jon Lomberg’s work, go here. What does NASA contribute to our nation’s future? The key to a brighter future for America is a new generation of bright, educated, highly talented Americans, well-trained to tackle the problems we will always face. No enterprise would better demonstrate our nation’s commitment to our young people than a vigorous, sustained program to establish ourselves on and develop the space frontier. If we want a world-beating corps of talented scientists and engineers, seasoned by taking on the toughest exploration voyages in history, there is no better way to create them than turning our young people loose to conquer Earth-Moon space and explore the solar system. Their talents, honed as they reach for distant worlds, will be invaluable as we face continued terrestrial challenges in defense, energy, environmental protection, and global economic competition. President Obama and NASA should work together to expand our investment in our surest guarantee of future prosperity—the talents, skills and imaginations of our children. The fictional “interview” above does not represent the views of any past or present NASA administrator. Has NASA done a good job of explaining why we must return to the Moon? In 2004, President Bush stated that one of our space goals would be to return to the Moon. 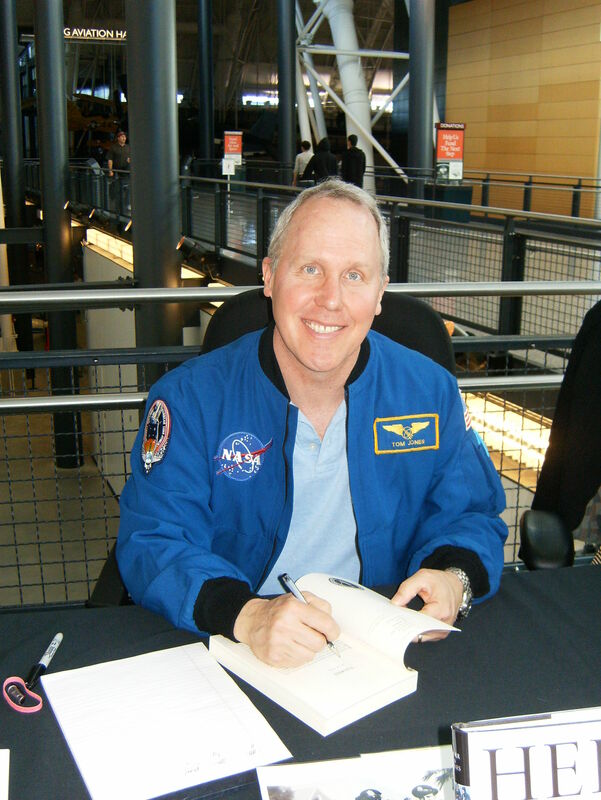 Despite Mike Griffin’s articulate advocacy of the need for U.S. leadership in space, the president did not follow up his direction to NASA with a public campaign to explain those new goals. So a return to the Moon has been perceived by some as merely a Bush priority. We have lost sight since 2004 of how the lunar goal, and deep space exploration in general, fits into a larger strategy. We must always explore, but Marburger is right: we must bring the Moon, the asteroids, and the other resources ofspace within the economic sphere of the U.S. and our partners. My job is to convince the President, Congress and the public that vigorous leadership in space is important not just for science, but for a secure and peaceful economicfuture. We can’t sustain our preeminence in space unless our leaders, me included, articulate repeatedly why exploration is an indispensable national priority. How will you strengthen NASA’s exploration agenda? Leadership requires clearly set goals, funding stability, and program momentum — a series of achievements that demonstrates progress. Mike Griffin tried to establish goals and momentum, but he wasn’t given the promised funding. As a result, the nation now faces a five-year gap in U.S. manned launches from Kennedy Space Center; NASA will rely instead on Russia’s Soyuz to reach ISS. But the perceived impact of this gap can be lessened by getting Orion operational in early 2014. To make that happen and shrink that gap, I’ll have to win additional Orion funding from the President. But that’s not enough. To maintain U.S. leadership in human spaceflight, the nation must commit to sending explorers not just to the ISS, but beyond LEO. By pulling back from deep space, we will confirm that, after forty years of foot-shuffling, Americans are turning away from the Moon, asteroids, and beyond. Our competitors will note that retreat, and I am certain some will move to seize the leadership we have ceded. Such a retreat also breaks faith with NASA’s astronauts. Since 2004, they have accepted the risk of flying the shuttle, knowing that their commitment is buying time for completion of the Station and the building of new systems that will enable ground-breaking exploration at the Moon, asteroids, and beyond. Some of these explorers hope to fly the new Orion, and lead our return to deep space. President Obama and I should not ask these brave Americans to accept the risk of more shuttle missions, for example, without commensurate return. I think deep space exploration delivers that return. Accepting a stagnant status quo in LEO does not. Even as we develop Orion and its Ares V deep-space booster, we can explore the Moon with a series of advanced robot explorers, as outlined by lunar scientist Paul Spudis. They can scout landing sites and prospect for water ice, volatiles, and attractive mineral deposits, and demonstrate the feasibility of resource extraction. If those resources justify establishment of an outpost, robot vehicles can reconnoiter a site, install navigational aids, and emplace habitat elements and supplies for later human explorers. Well before humans arrive, we can establish a sophisticated virtual presence on the Moon, material proof of the seriousness of our abilities and commitment. Beyond the Moon, Orion and Ares will also bring within reach a small but fascinating population of Near Earth objects (mostly asteroids), prized for both scientific value and attractive resources (water-bearing minerals, for example). Setting out for these rocky footholds will be the most daring human expeditions in history, and confirm U.S. mastery of Earth-Moon space. Robotic and then human exploration of NEOs will provide invaluable deep space experience, open new economic opportunities, and provide hands-on engineering information needed for deflection of any NEO that threatens Earth. Want a “green” space mission? Defending Earth from a devastating impact would seem to fill the bill. Should the U.S. stay committed to human exploration of deep space? No job at NASA will be tougher or more important than communicating to President Obama’s new team the economic and national security benefits of maintaining our leadership in space exploration. We are already at the forefront of robotic exploration of the solar system and the universe. What is in doubt today is our continued leadership in sending human explorers into Earth-Moon space and beyond. I am concerned that the new administration’s tepid campaign endorsement of America’s human exploration goals may eclipse five years of bipartisan endorsement of returning Americans to deep space. Unfortunately, that support came without the necessary funds. President Bush’s budget decisions and recent congressional continuing resolutions have sapped momentum from NASA’s Orion development. 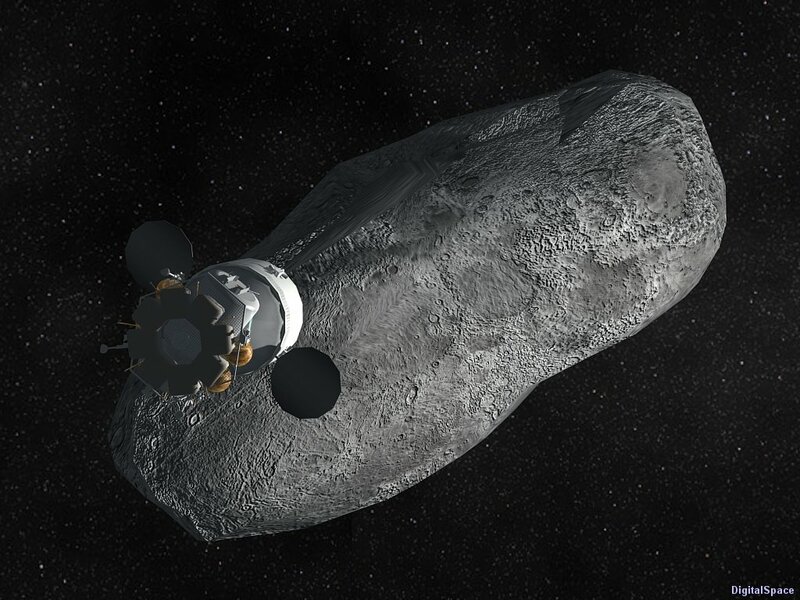 Suggestions of a wholesale reordering of our exploration priorities call into question not just Orion’s delivery, but America’s determination to lead in space. Disclaimer — This interview is fictional and represents only the views of the author.– Disclaimer. How the next NASA administrator might view his/her responsibilities. Should the shuttle retire in 2010? Yes. Reliance on Russian crew transport to ISS would not have been my choice, but Congress and the previous administration did not fund the shuttle’s replacement adequately. We will face a U.S. launch gap from Cape Canaveral for at least four years. But despite recent disagreements with the Russians, they appear interested in continuing space cooperation. A nearly twenty-year partnership has created a healthy and workable collaboration in daily ISS operations. With their future in space tied firmly to the ISS, providing U.S. access to the Station via Soyuz is in their self-interest. I believe Russia will live up to its commitment as NASA retires the shuttle and tests Orion. With ISS access assured, I will recommend retiring the orbiter fleet in late 2010. Budget pressures and the shuttle’s inherent vulnerabilities make its timely retirement a high priority. 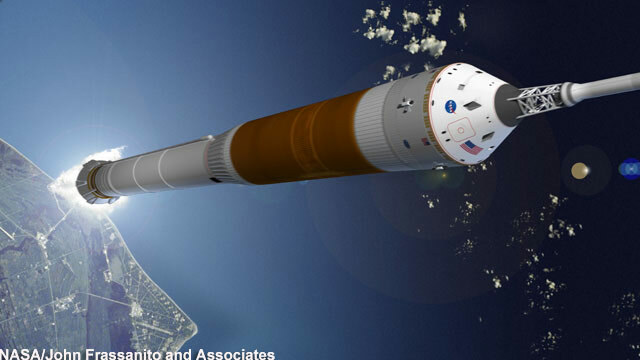 Funds freed by shuttle retirement are essential to fielding the Orion/Ares system. NASA’s budget has declined 20% over the last fifteen years, and we must have resources commensurate with the challenges before us. As we execute an orderly shuttle retirement, I will ask the Obama administration for new money this year to accelerate Orion’s debut and free us from dependence on Soyuz. What role do you envision for the ISS? Between 2011 and 2015, NASA will spend about $50 million per seat to send astronauts to the ISS aboard the Soyuz. To realize the benefits from our investment in the Station, I will ask the President for budget authority to jump-start our research program on ISS, both to prove new exploration technologies and produce the economic payback that first justified its construction. The Alpha Magnetic Spectrometer, whose launch to the Station I support, will search for the universe’s antimatter and dark matter. We will also pursue promising partnerships in the biomedical area and test the technologies (life support, resource utilization, and power) needed for deep space exploration. For example, space-grown bacteria have brought us close to introducing an effective vaccine against the salmonella bacterium, a major source of food-borne illness that kills more than 400 Americans each year. I will seek to raise long-term commercial interest in ISS by extending ISS operations beyond 2016. To do that, I’ll have to convince President Obama to override long-seated resistance to the Space Station in his own Office of Management and Budget. The exploration of space will go ahead, whether we join in it or not, and it is one of the great adventures of all time, and no nation which expects to be the leader of other nations can expect to stay behind in the race for space. Bringing up the rear of the President Obama’s inaugural parade (video), NASA’s Small Pressurized Rover prototype, carrying NASA engineers and veteran astronauts Mike Gernhardt and Rex Walheim, strutted its stuff before the largest crowd in Washington history. But it’s a long way from Pennsylvania Avenue to the Moon. Whatever momentum the Rover generated on January 20 will be difficult to sustain in light of the nation’s fiscal crisis and mixed signals from the new administration. The week of the inauguration, I joined NASA’s next administrator in the Apollo-era blast bunker under Launch Pad 39A at Kennedy Space Center for a conversation about America’s future in space. 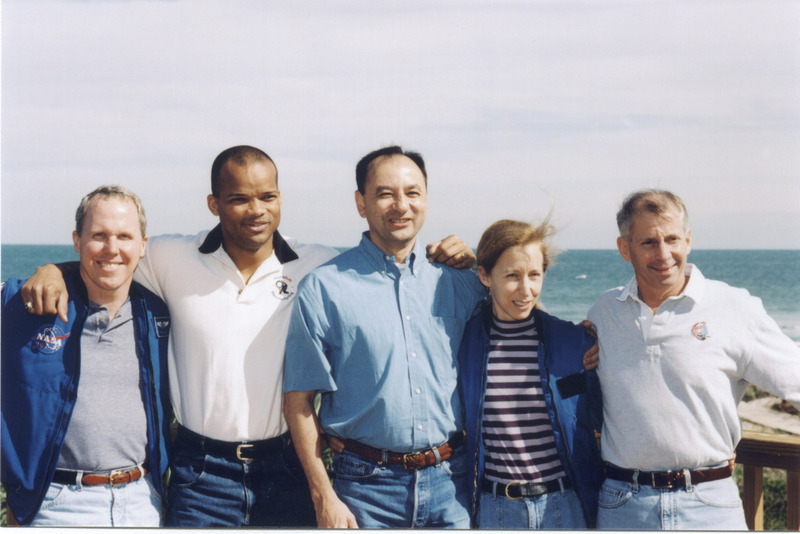 What is your first priority as you take the reins at NASA? Your shuttle crews returned safely. Two others did not. Those accidents were both tragic and entirely preventable. Because of the recovery and redesign efforts following both Challenger and Columbia, the shuttle today is safer than it has ever been. 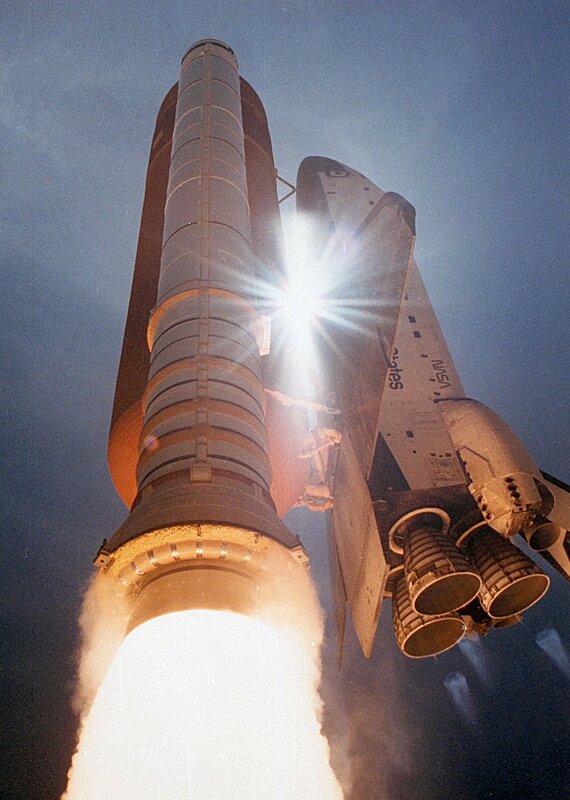 Yet the space shuttle is a system conceived nearly forty years ago; the orbiter fleet’s structural elements and major subsystems are now twenty-five years old or more. Flying the shuttles safely for the remaining nine missions (or more, depending on administration choices) will require extraordinary attention by the shuttle team. The Columbia Accident Investigation Board doubted NASA could sustain such focus for more than a few years. Because another shuttle accident would halt U.S. human spaceflight in its tracks, and cast enormous doubt on whether NASA should be entrusted with even more ambitious (and hazardous) ventures, I will keep flight safety my first priority. I will also push hard to make the Orion crew exploration vehicle (and its launch systems) far more robust and survivable than the shuttle. With Constellation managers and the contractor team, I will pay special attention to Orion’s launch abort system, system redundancy criteria, and Ares I reliability. I also believe that Ares I, with a shuttle-derived solid rocket booster and an Apollo-Saturn J-2X upper stage engine, is the safest vehicle for delivering our astronauts to low Earth orbit (LEO). New systems may eventually succeed Ares I, but it’s the fastest and safest route to LEO on the horizon. On the night of Feb. 17, I visited the Catalina Sky Survey‘s 60-inch Near Earth Object search telescope on the summit of Mt. Lemmon, above Tucson, Arizona. On hand were astronomers Steve Larson and that evening’s observer, Alex Gibbs. 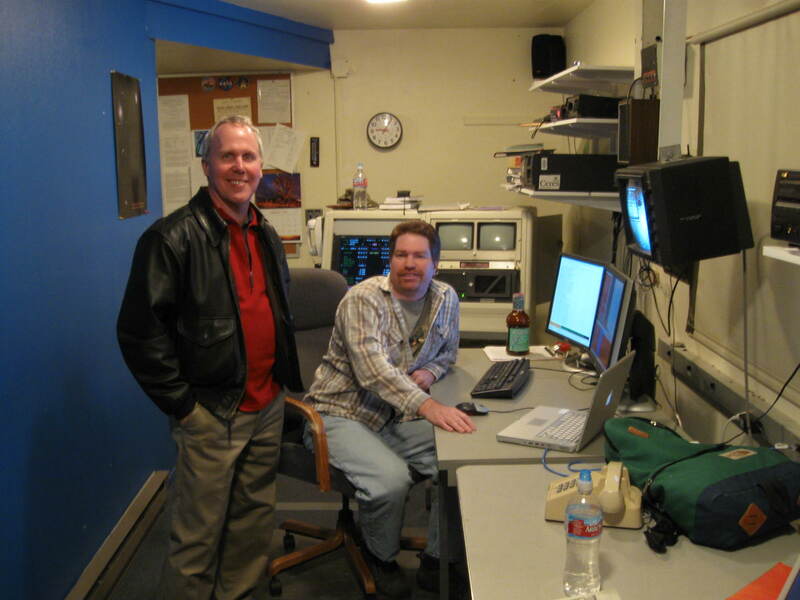 Larson is the principal investigator and Gibbs one of the team members of the Catalina Sky Survey, the most productive searchers for Near Earth Objects today. 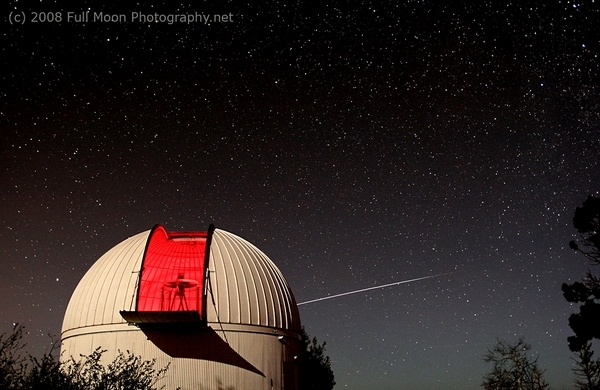 Richard Kowalksi shot the 60-inch dome on Mt. Lemmon. The ISS streaks across the sky at rear. 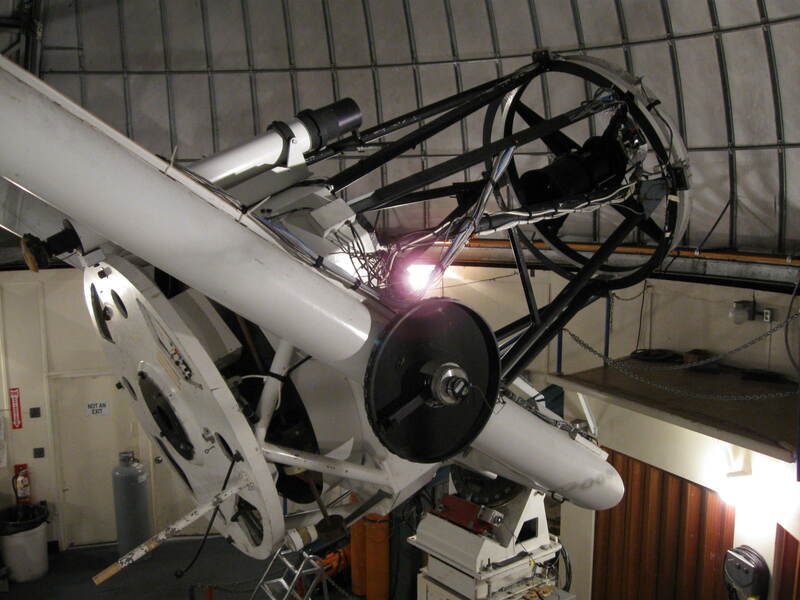 Their efforts depend on two telescopes, the 60-inch atop Mt. Lemmon (9,154 feet) and a nearby 68/76-cm Schmidt telescope, also equipped with CCD detectors, on Mt. Bigelow (8497 ft). . When I visited, it was snowing; observing was impossible, but the night’s beauty was still evident, and I did get a thorough tour of the bigger telescope for our Association of Space Explorers efforts on NEO impact decision-making. NASA funds the Catalina Sky Survey to the tune of under a million dollars per year; more robust funding will be needed if we are to search for smaller NEOs that may threaten Earth with destructive impacts. Congress has directed such a small-object survey (down to 140 meters in diameter), but because it did not fund NASA to carry it out, the space agency has not spent any money to pursue that goal.I discuss the impact process in my book Planetology and our current efforts to head off a future impact in my Aerospace America article (Oct. 2008). Larson and company have created efficient software to aid their sky search and identify new NEOs. 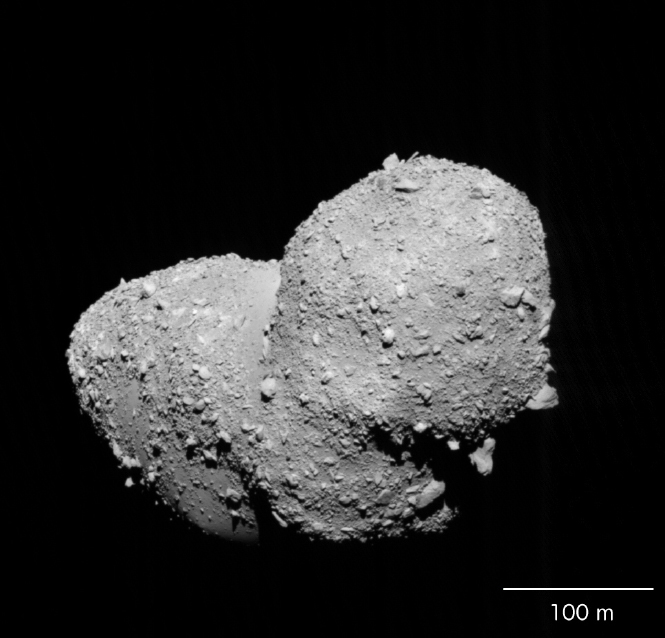 The team discovered 2008 TC3, the small asteroid fragment that was detected less than 24 hours before Earth impact last October. Thank you, Steve, for a marvelous tour. I’ll come back when the skies are clear. Good luck! Enjoy this time lapse of the Schmidt in operation, courtesy of Richard Kowalski. The rising Milky Way is stunning. In the Feb/mar 2009 issue of Air & Space Smithsonian magazine, geologist and volcanologist Bob Craddock reviews Planetology: Unlocking the Secrets of the Solar System. …The joint effort resulted in one of the book’s most important images: the Virunga volcanoes, located on the border of Congo and Uganda. The image was requested by the Dian Fossey Gorilla Fund so that the organization could better map the habitat of the area’s endangered mountain gorillas. One example, which demonstrates the fury of Earth’s own geology, shows Stofan and her daughter standing next to a large rock expelled from Italy’s Mount Etna when it erupted days before the photo was taken. Ellen and I are grateful for the review, and we know you’ll enjoy the book as well. 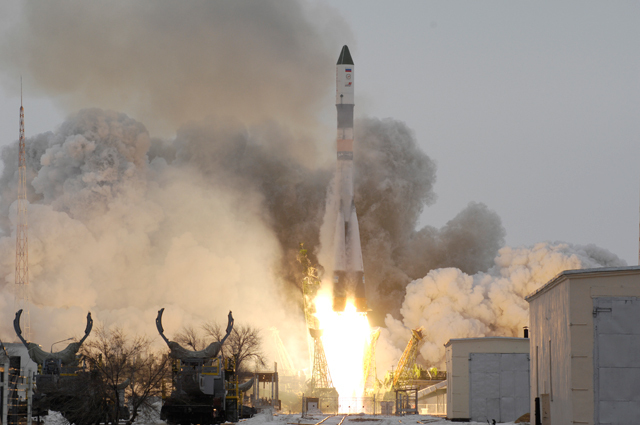 Russia launched its latest cargo ship to the International Space Station on Feb. 10, 2009. The Progress M-66 robot cargo ship, carrying 2.4 metric tons of cargo to the ISS, will supplement cargo to be delivered on the Space Shuttle Discovery on the upcoming STS-119 mission. The Progress, based on the Soyuz crew transport spacecraft, uses the reliable Soyuz booster to get to Low Earth Orbit, then performs an automated rendezvous with the ISS. The crew onboard monitors the Progress approach, and can take over for a manual, remote-controlled docking should the Progress autopilot system drift off course. Russia provides Progress report to the Station as part of its commitment to the international Station partnership. NASA has decided that from 2011 on it will no longer purchase a portion of the Progress capacity, instead relying on commercial cargo shipments to the ISS from its contractors, like SpaceX and Orbital Sciences Corp. In addition, international vehicles like the ATV and HTV (from Japan, first launch in Sep. 09) will also haul cargo to the Station. Progress M-01M last week undocked from the Station, carrying trash, crew waste, and surplus gear. The Progress, which had been in orbit at the Station since November, reentered the atmosphere and burned up over the Pacific. The incinerated contents of the spacecraft were dispersed into the atmosphere; a few fragments probably reached the ocean. Next time you wipe down your bookshelves, consider where some of that airborne dust might have come from. Last time I was at the ISS, eight years ago during the STS-98 mission, no Progress was docked, but a load of Progress cargo was evident inside, strapped into the walls of the FGB module.